The holiday season is just around the corner — And the City of Frederick, local non-profit organizations, and the Frederick business community are ready to once again make this the most wonderful time of the year! Throughout the holiday shopping season — starting on Thanksgiving Day and ending on New Year’s Day — on-street and public garage parking in the City of Frederick will be free every Saturday and Sunday. Not ready to take on the insanity of a typical Black Friday? Kick off your holiday season with all-day shopping in Frederick instead! Parking in downtown will be FREE, shops & eateries will be open early & stay open late, and - thanks to the Downtown Frederick Partnership - a free trolley will be circulating downtown every 15 minutes to make your holiday experience stress-free & fun! Additional special events throughout the day include: horse-drawn carriage rides (purchase tickets in advance), caroling and live music, Santa! !, the holiday lights unveiling, and more! See the full calendar of events on the Downtown Partnership’s website. Created as a counterpart to Black Friday and Cyber Monday, Small Business Saturday is a holiday to encourage shoppers to patronize brick and mortar businesses that are small and local. Show your support to our locally-owned businesses which play such an important role in our community, and enjoy some free “Shop Small” swag while supplies last. Fifty downtown businesses will be open 7 days a week from Frosty Friday (November 23) through the last weekend in December — with plans to stay open until 8 p.m. on Thursdays & Fridays, and 9pm on Saturday. As you bustle around crossing off your list, be sure to enjoy the many festivities Frederick has to offer! Check out holiday shows at the City’s Weinberg Theatre, including: Lightwire Theatre - A Very Electric Christmas 2018, Tuba Christmas, It’s A Wonderful Life, The Nutcracker Ballet, A Christmas Carol, The Messiah Sing-Along, Cherish the Ladies: A Celtic Christmas and more! Expect additional fun & events - including live music & free trolley rides - provided by the Downtown Frederick Partnership every Saturday through December. 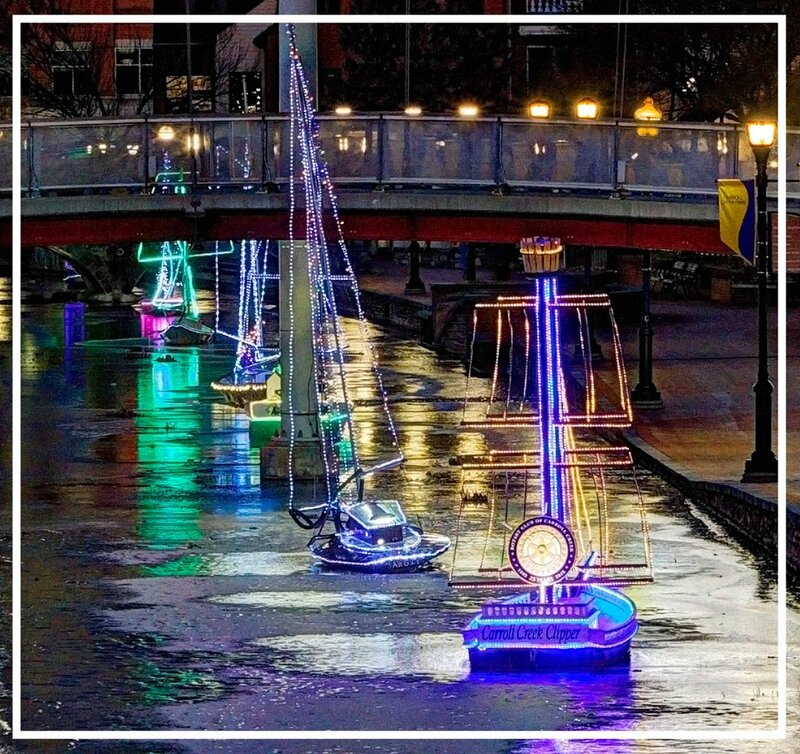 ‘Ooh’ and ‘ahh’ at the impressive holiday lights — on storefronts and tree tops - organized by the Downtown Frederick Partnership, and at the twinkling armada of boats launched along Carroll Creek by Color on the Creek. Actually, with the help of local non-profits and the Frederick business community, you can go ahead and schedule your entire December for merriment and cheer. Check out VISITFREDERICK’s Complete guide to Frederick’s holiday SEASON here. Photo Credits to Frederick Tour!